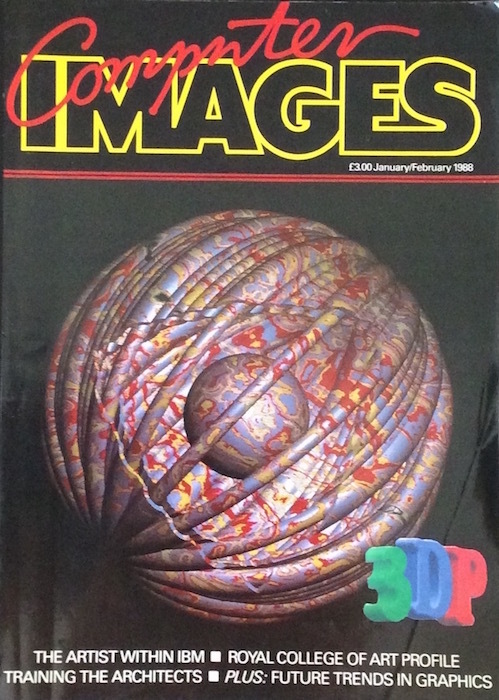 Magazine from 1988 - William Latham (IBM) comments on considering SLA "Fotoform" method to recreate his digital 3D images. 1859 Paris France, A Sculptor and Photographer created a 3D model using 24 radially equi-spaced cameras around the subject. The silhouette photographic profiles would be used to create a representative 3D object of relative coarse resolution. 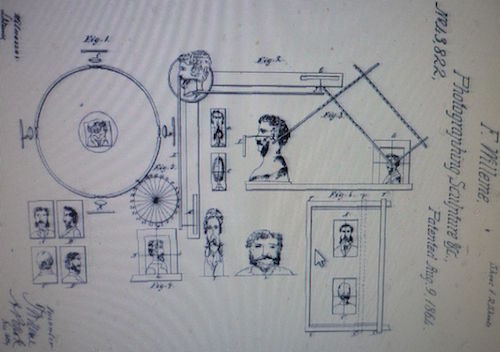 A USA patent 43822 was granted in 9th August 1864. 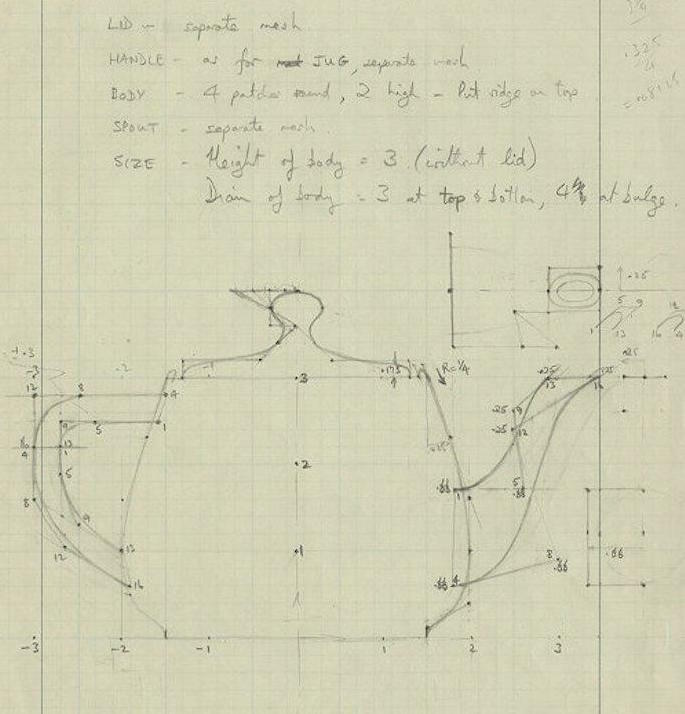 3rd May1892, Blanther suggests the manufacture of contour relief maps using wax sheets cut out and stacked then smoothed. Both positive and negative impressions are made and a printed paper map could then be pressed between the two, showing elevations and depressions representing hills and valleys, to a relative scale. 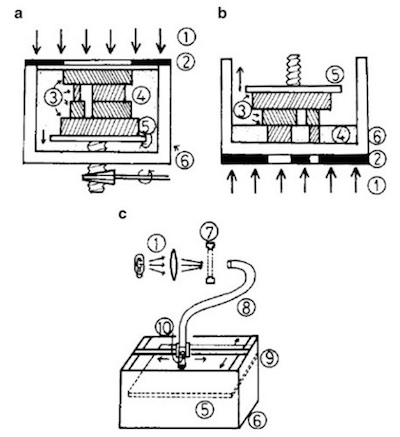 The present invention is directed toward improved media for use in production of true three-dimensional sensible objects in apparatus utilising the combined effect of at least two intersecting beams of radiation to form an active region within the volume of medium, which active region is manipulated to shape the desired three-dimensional sensible object. November 1981, Hideo Kodama of the Nagoya Municipal Industrial Research Institute (Nagoya, Japan) published a paper, title shown above. 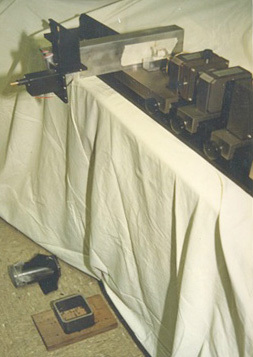 It describes three basic techniques he used to create plastic parts by solidifying thin, consecutive layers of photopolymer. Photo masking from the top, underneath and through an optical cable controlled by X & Y positioning. 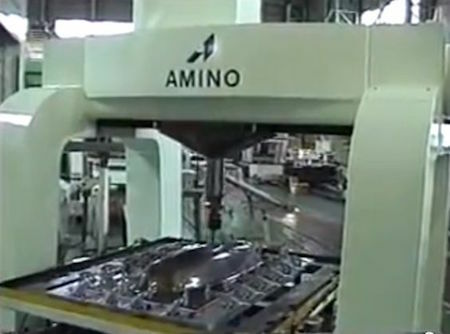 Computer Automated Manufacturing Process and System. 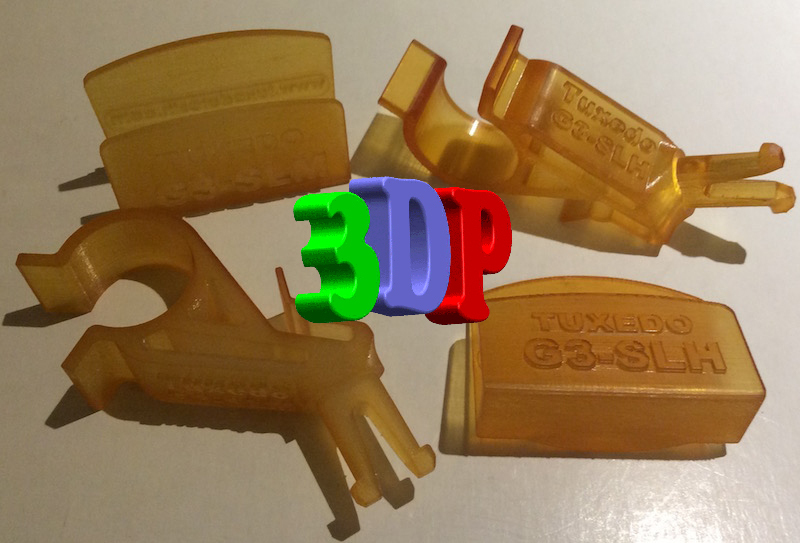 Patent granted July 2nd 1984 (US 4665492) by William E Masters his first 3D Printed object from his Personal Modeller 2100 shown in these two pictures below. 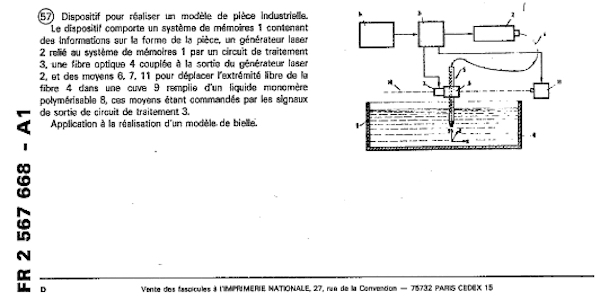 On July 16 1984 three French inventors, Alan Le Mehaute, Oliver De Witte & Jean Claude Andre filed their patent ( FR 2567668 A1) for the laser polymerisation within a vat of liquid resin process. 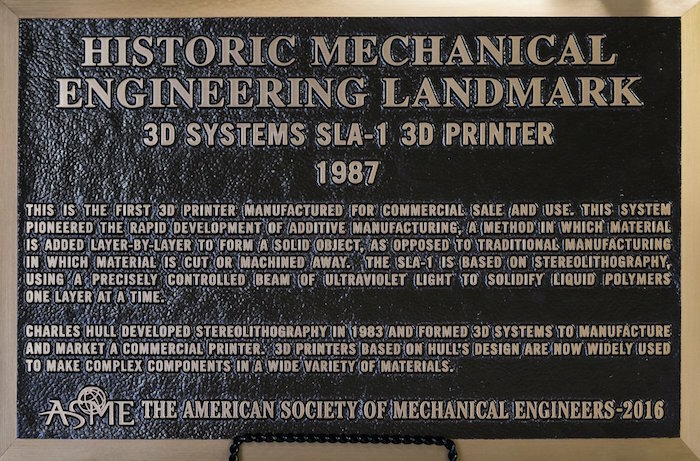 However exploitation was abandoned by the French General Electric Company & CILAS (Laser Consortium) due to "lack of business perspective"
Resin Curing 3D printer, the SLA-1 from Chuck Hull. 8th Aug 1984 Patent Granted. 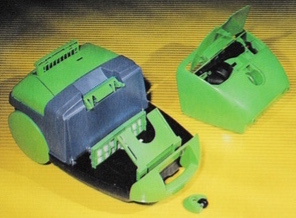 The SLA250 followed and became very popular. 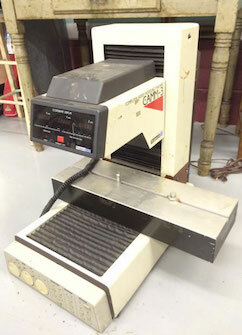 Curing process and the machine was called Solider 5600. 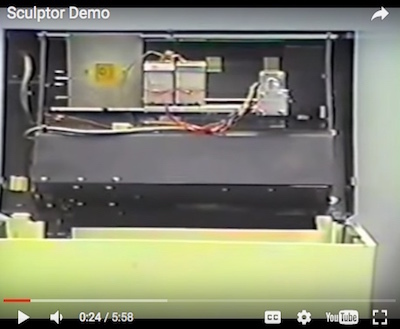 A spin out company from Scitex Corporation that became Cubital Ltd. 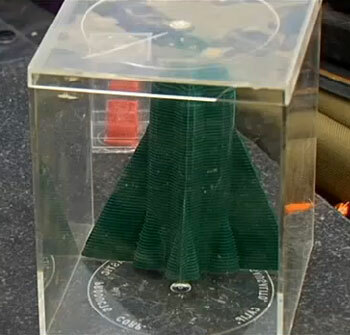 This model created at the Detroit Office of Haim Levi by a young Mathematics student from Northwestern University who worked as a Solider 5600 machine operator. Cubital termed the model Brain Gear. 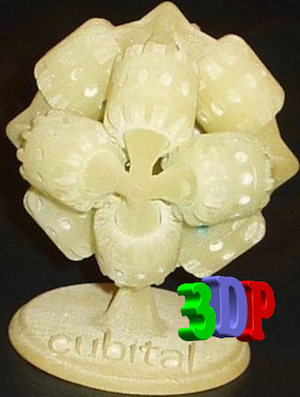 The Sculptor (Visual Impact Corporation) 3D inkjet prototype is based on U.S. Patent US5136515 A (4th Aug. 1992), method and means for constructing three-dimensional articles by particle deposition. 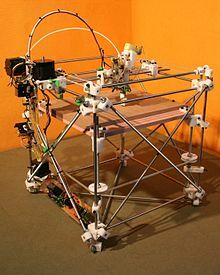 2005 REPRAP "Darwin" original self replicating 3D Printer. 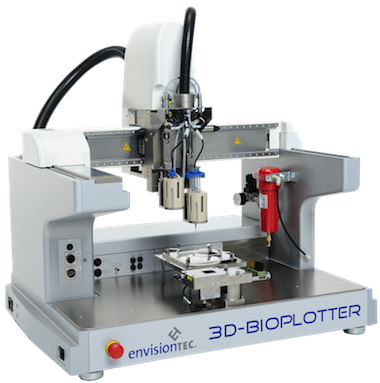 Inventor Adrian Bowyer and creator of the global initiative to develop a 3D printer that can print most of its own components and be a low-cost 3D printer. Is this the first Formative process?